"...I have never seen anything better that can be adapted to any teacher. It is remarkable how children will behave when they know what is expected and that nothing else will be accepted. It takes a lot of planning and teaching up front, but the instruction time that is saved later is worth it. I love that it is data driven so people are not arguing what the problem is, the data tells you. I think it is important that people know that this program is not about keeping children under control, it is about teaching children how to control their own behavior." 47% of students qualify for the Free/Reduced Lunch Program. 10% of students receive Special Education Services. 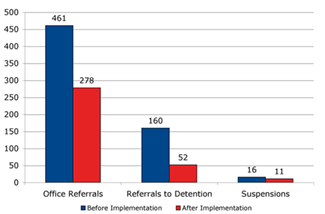 In one year's time, Beechgrove reduced office referrals by 40 percent, referrals to detention by 68%, and suspensions by 31 percent.